Sen. Manny Pacquiao recently sent out a tweet of exasperation in the wake of the split draw that was announced at the end of the Gennady Golovkin-Saul Alvarez fight in Las Vegas last Saturday. While the decision was acceptable considering the close contest, what wasn’t acceptable was judge Adalaide Byrd’s score of 118-110 for the Mexican. Byrd’s insane count was the subject of scorn all over the boxing world and took away the media spotlight from the high-level of competition that both fighters delivered. “Did they bring these judges over from Australia?” was Pacquiao’s tweet, referring to his loss to Jeff Horn by a unanimous verdict in Brisbane last July. In that bout, Horn’s dirty tricks were tolerated by referee Mark Nelson and the judges swept the Australian to the WBO welterweight throne. Judge Waleska Roldan saw it 117-111 while judges Chris Flores and Ramon Cerdan 115-113, all for Horn. Even ring legend Bernard Hopkins couldn’t believe Horn beat Pacquiao. He said: “How does a guy like Horn, who probably didn’t win four rounds, win a unanimous decision in a 12-round fight? First, he’s fighting in his home country, Australia, even though two of the judges were American and one was from Argentina. I do know one person who is happy----Horn’s promoter. Recall that in 2004, Pacquiao was robbed of a victory by a split decision when judge Burt Clements made a mistake in scoring the first round 10-7 instead of 10-6. That was in Pacquiao’s first encounter with Juan Manuel Marquez who went down thrice in the opening round. Under boxing rules, a fighter who registers three knockdowns in a round is awarded a 10-6 score. If Clements had scored it correctly, Pacquiao would’ve won. But since he didn’t, it went down as a split draw. 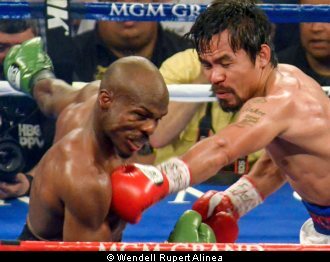 In 2012, Pacquiao lost to Tim Bradley on a split 12-round decision that was considered a joke by the boxing cognoscenti. The WBO even gathered a panel of independent judges to re-score the fight from a TV monitor and the review confirmed Pacquiao deserved to win. Bradley’s “win,” however, stuck. They fought twice more with Pacquiao winning both fights and retiring Bradley for good. There was also doubt on the credibility of judge Dave Moretti’s 118-110 score favoring Floyd Mayweather over Pacquiao in their bout two years ago. Clements and Glenn Feldman, the two other judges, scored it 116-112, both for Mayweather. Surely, Moretti’s wide margin was out of line. So when Pacquiao reacted negatively to the draw in the Golovkin-Alvarez fight, he had the benefit of experience to justify it. He’s no stranger to bum decisions.